Welcome back to the fourth week of the Spire & Co 30 Days to Self-Love Challenge! For week #1 and week #2, please click here. For week #3, please click here. One. More. Week. We hope that adopting a gratitude practice last week has helped to shift your worldview and, more specifically, your view of yourself, into a totally new (and brilliant) light. Gratitude teaches us to be more positive, more loving, and more aware of the world around us. It helps us get in touch with our truest selves. It transforms us into a being who vibrates higher and loves more loudly. Week 4 is about extending that practice we cultivated last week into a celebratory state. That’s right: arm yourselves with streamers, confetti cannons, and a cupcakes topped with affirmations because we are about to partake in some serious self-love celebrations. What we’ve learned over the past three weeks is (a) your why - why you want to love yourself more and vibrate higher, (b) your strengths and what makes you incredible beyond words, and (c) how a gratitude practice can elevate the love you have for yourself. We’re bringing it all together to truly revel in who you are and why you should spend intentional time each and every day being kind and gentle and all-around amazing to yourself. Take out a piece of paper and write your name in the middle. Doodle hearts, flowers, stars, fireworks or whatever makes your heart happy. Then, begin to fill the page with love for yourself. Celebrate EVERYTHING. Write down your favorite quotations, your favorite attributes, things you are grateful for, times you were proud of yourself, times that you grew, and times you felt on top of the world. Like the list you made on Week 1, this piece of paper will help act as both an anchor that grounds you and a map for the future. Right here in front of you, you have everything you need to know about yourself. Yes, you are a complex and deeply flawed, but yes you are also a beautiful and unconditionally loved human. As said by The Buddha, “You, as much as anybody in the entire universe, deserve your love and affection.” Allow these four weeks to be an incredibly significant step towards setting yourself up for a life of love and affection provided to yourself by yourself. In times of crisis or excess stress, it can be so easy to abandon the tools we have been given to practice gentleness, kindness, and love. Rise above the pressures of everyday life and take the time to truly both know yourself and celebrate yourself. Even in the darkest of hours, self-love is an incredibly important practice to maintain. 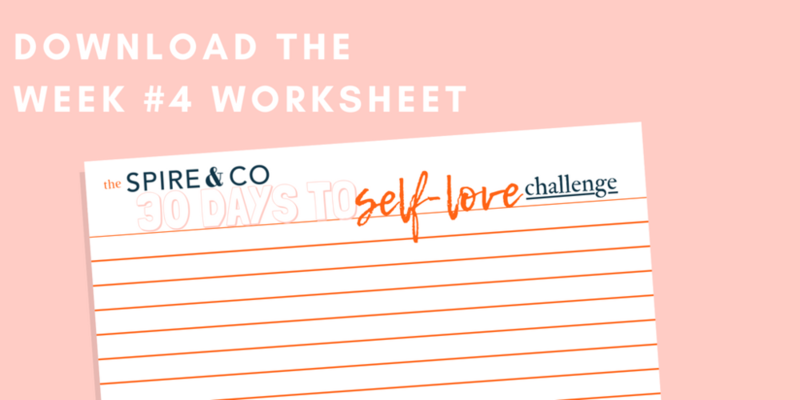 Challenge yourself to use the guide we have created over the past four weeks throughout the months to come until self-love is second nature. Go forth and be light. First to yourself, and then to the world.